This post is sponsored by Everywhere Society; however, all thoughts and opinions expressed are my own. Have I ever mentioned before just how much I love Macy’s? From fun fashion shows to culinary events, they are always hosting something fun while giving back to the community. 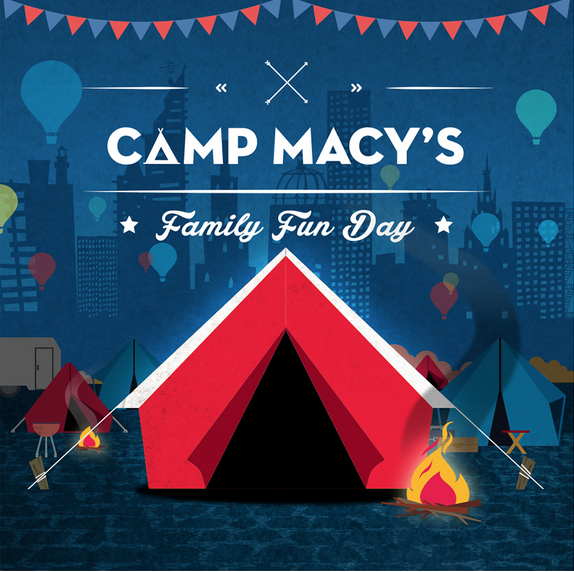 Next Sunday, June 14th, Macy’s will be hosting a family fun event called Camp Macy’s – and it will be held at the Clackamas store here in Oregon, but I know they will be hosting events across the country – so keep your eyes open for one near you! What is Camp Macy’s? It’s part of their summer American Icons Campaign, and Camp Macy’s will be having all sorts of in-store activities that will bring back camp nostalgia from people of all ages. There will be readings, storytelling, bingo, snacks – as well as crafts to show off your American spirit – refreshments, giveaways and more! This camp is all about enjoying family time and summer activities – and I just love how Macy’s is bringing families together for these events to create lasting memories! The event begins at 2:00 pm – and while you’re there, take a few photos and use the hashtag #AmericanSelfies – Macy’s is donating $1 for each hashtag (up to $250K ) to support American Veteran’s with Got You 6. A handful of winners will be selected for a spectacular moment in the Macy’s Fourth of July Fireworks show on NBC!